"The only weapon you have to fight back with is love." That's an amazing quote from Mark Wahlberg in Patriots Day, one of the best films of the year. 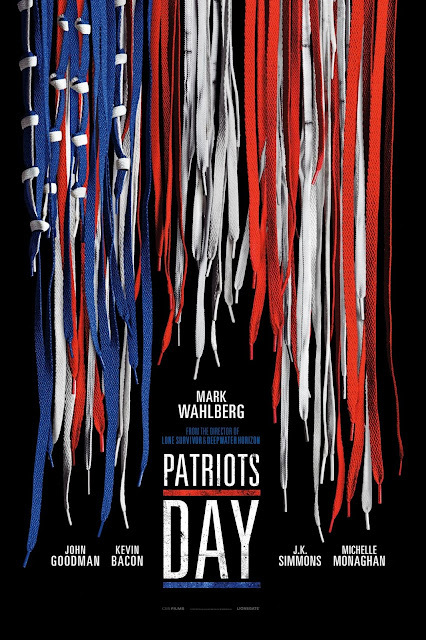 The film is based on the 2015 book Boston Strong by Casey Sherman & Dave Wedge, which documented the 2013 Boston Marathon bombing. Wahlberg plays Sgt. Tommy Saunders, a member of the Boston Police Department. On April 15, 2013, the day of the Boston Marathon, Saunders is scheduled to monitor the race. His wife, Carol (played by Michelle Monaghan), is down at the race as well. Also at the race are husband & wife Patrick Downes (played by Christopher O'Shea) & Jessica Kensky (played by Rachel Brosnahan), along with Steve Woolfenden (played by Dustin Tucker). At 2:50pm, about 4 hours into the marathon, brothers Tamerlan (played by Themo Melikidze) & Dzhokhar (played by Alex Wolff) Tsarnaev detonated two bombs, about 12 seconds & 210 yards apart apart, killing 3 people, & injuring 264 others. After the bombing, Saunders, along with Boston Police Commisioner Ed Davis (played by John Goodman), Boston Police Chief Billy Evans (played by James Colby), Watertown, Massachusetts Police Sgt. Jeffrey Pugliese (played by J.K. Simmons), FBI Field Agent Richard DesLauriers (played by Kevin Bacon), Massachusetts Gov. Deval Patrick (played by Michael Beach), & Boston Mayor Thomas Menino (played by Vincent Curatola) investigate the bombings & search for the bombers. 4 days later, on April 19, 2013, Tamerlan & Dzhokhar kill MIT Police Officer Sean Collier (played by Jake Picking), & carjack student Dun Meng (played by Jimmy O. Yang), stating that they intend to bomb New York City next. This eventually leads to a shootout where Tamerlan was killed, leading to a manhunt for Dzhokhar, which caused the city of Boston to be shut down. Later that night, Dzhokhar was arrested. A postscript reveals that Dzhokhar was sentenced to death. The cast was excellent. Peter Berg's direction is excellent, with this being one of his best films yet. The screenplay by Berg, Matt Cook, Joshua Zetumer, Paul Tamasy & Eric Johnson is amazing. The editing by Colby Parker Jr. & Gabriel Fleming is brilliant. And the film score by Trent Reznor & Atticus Ross is astounding. This is one of the year's best films, a testament to real-life American heroes.